I know I usually do my Bead Surfin post on Sunday, but I was soooo busy moving my studio that I didn't even turn my computer on yesterday. I have made good progress, with the help of my mom(Thanks mom!) in getting everything moved. I just need a really big coffee table and I will be ready for the "big reveal" as they call it in showbiz. Oh and I have to put the humongous pile of beads away that is on my work table. Moving a studio really makes you see how many beads you really have. I couldn't believe what I found. Okay, Okay, enough about the studio. 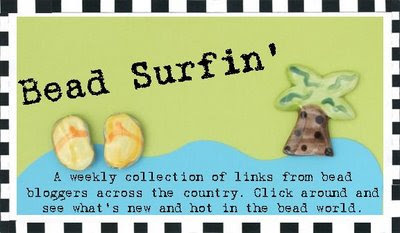 I am going to post my surfing links below and get to work glazing beads for orders. I have lots of things to keep me busy today. Are you making Halloween jewelry? Or, is this holiday not a big jewelry time for you? Win prizes! The ABS Monthly Challenge is filigree. Cyndi describes the process of putting together a multistrand necklace that features lots of wrapped-loop dangles. Snap out of it, Jean! There's beading to done! Jean talks about the Bead a Day Calendar for 2009 in which she appears, and adds that she also uses Melanie of Earthenwood beads in one of her projects for it! See photos!